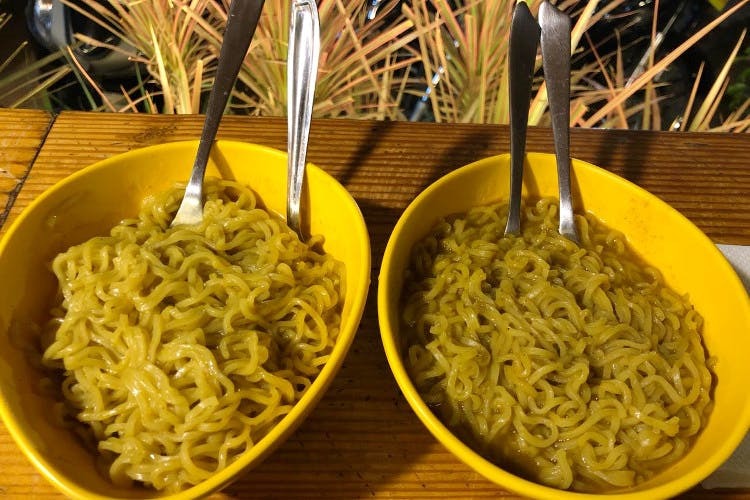 Head to Gossip Coffee Shop in Madhapur for amazing coffee and Maggi after a swimming session at its next-door neighbour, Seasons Swimming Pool. It's pocket-friendly too. Seasons swimming pool in Ayyappa Society has a tiny cafe attached to it called Gossip Coffee Shop. It has one of the best coffees we’ve tasted. Don’t go by how the place looks from the outside, step in and you will realise that it’s quite quirky and cozy. Their interiors have floral wall art and wooden tables with AC. They also have a sit-out area with high seating and that’s where we sat (thanking the good weather!). We got ourselves coffee (oh the aroma of it and the frothy serving!) and double masala Maggi, yum! It is quite a peaceful place and ideal for evening snacks with friends. Their menu has everything from breakfast and salads to ice creams and burgers. So, no matter what time of the day it is, or what your tum is craving, Gossip Coffee Shop will sort it all out. Take your pick from cheese Maggi, veggie Maggi, egg bhurji Maggi, and chicken Maggi and devour it. Their drinks menu is quite impressive as they have a lot of variety, from flavoured tea (cinnamon, masala, green, lemon tea), milkshakes, soups, to vegetable juices, mocktails, ice tea, cold coffee, and lassi. They often keep adding new items to the menu that you should keep an eye out for. If you're with a big group, it might be a little congested.